This page provides you with Freelance Writer resume samples that you can use for inspiration in writing your own resume, or for creating one through our easy-to-use resume builder. Below you'll find our how-to section that will guide you through each section of a Freelance writer resume. A freelance writer often requires a “close to perfection” resume. Why? Well, first of all, you are a writer and everyone expect you to be fantastic at writing nonetheless. Secondly, competition in this industry is extremely high, as you have to battle with thousands and thousands of writers all over the world vying for the position: it’s time to have a great resume that stands out among the crowd and truly draws the attention of the employer! We have helped many freelance writers like you get the job they have always dreamt of, but it won’t be easy, so make sure you relax and enjoy the journey. Get inspired by the best freelance writer resume sample and let yours shine! 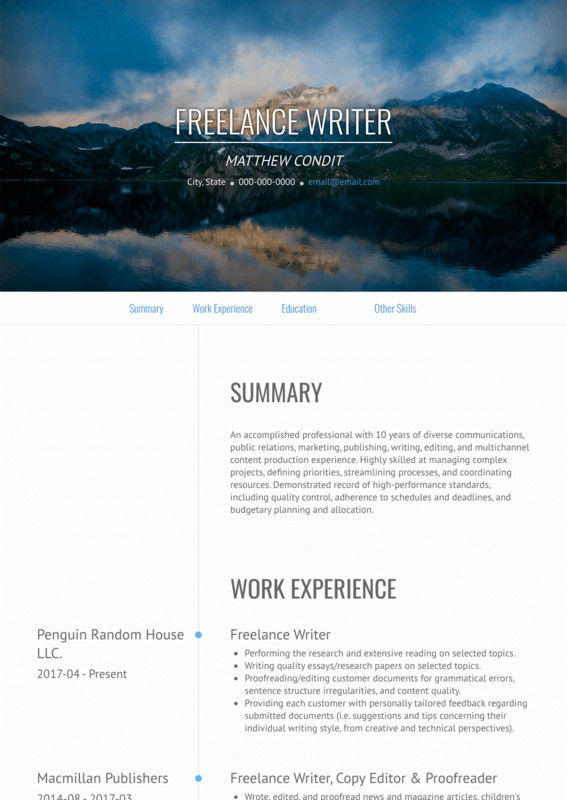 How to Write a Freelance Writer Resume? We are all for freedom with our professional users, but in this case we strongly suggest a functional (or combination) resume format, definitely the best choice to show off your qualifications and experience. The main reason behind this choice is that this format highlights skills over chronological work history and, in a creative job like yours, what you can do is more important than when you did it. Computer literacy, fast word-per-minute typing and attention to detail are three very important skills freelance writers can have and you have to concentrate on these when creating a resume. Talking about the skills or talents you’re most proud of can be a great way to showcase talents without being too pushy or overconfident. Start off by choosing a writing style and a font. Fonts might not seem overly important but remember, it’s the first thing people will see when they read the resume and if they don’t think it looks professional they’ll look elsewhere. Choosing a font is simple enough and often it’s the more basic of styles which can be far better. Arial, Times New Roman and Calibri along with many other styles can be good as they are easier to read. Next, choose a letter size which is suitable for people to read. 11 or 12 can be an appropriate size to choose depending on the type of font being used. Remember, any bigger and it might look a bit stupid. Don’t forget to include any award or accolades and if you have a professional blog, make sure the recruiter knows about it! Finally, we strongly suggest you save your resume as a PDF to keep the layout intact - sorry, Microsoft Word! You have a summary for a reason – it sums up the person and the professional you are. Without a good summary your resume can be like all the others and it can often get lost in the sea of resumes employers have on their desks. However, a simple summary can change all that and ensure yours don’t get forgotten. Our tips below will help you create a simple summary that will definitely grab the attention of the employer. Talk about why you believe you are right for the job. Include your experience in similar fields. Try to spill every piece of work history into your summary. Talk about jobs that aren’t related to this one. As a freelancer, it’s quite likely that you have worked on a lot of projects with different clients. The best option is for you to have a personal website you can link to, or even a portfolio for the recruiter, who will definitely be interested in checking the quality of your work. At the same time, please be as current as possible about your most recent collaborations and make sure you include the location of your work too - as you know, freelance writers are more flexible as they often are able to choose when and where they work so that appeals to employers. Knowing you are committed to your work can appeal to employers everywhere in the world! Add responsibilities which make you best for this specific position. Put in information which doesn’t relate to writing. Embellish about your writing experience or history. Talk endlessly about your past duties as a writer. For more tips on writing the best work experience section for a freelance writer like you, check out our detailed resume guide. The name of the school you attended. The number of years in that education. Once you’ve talked about the basics of your education you may want to move onto any other further education. It could be you’ve taken several writing courses from proofreading courses to Microsoft Office and beyond and, while you shouldn’t list all the basic skills you have, it’s good for employers to know you’re proficient in many areas. Talk about any education you’ve undertaken for writing, even if it doesn’t come with a fancy degree. It shows people you’re serious as a professional writer. As a freelance writer, your skillset is incredibly broad, when compared to other professions. And while you want to bring out your skills in the resume, you should also be able to identify which ones perfectly fit the job offer and include these only. Sit down, take your time and ask yourself what skills you should prioritize versus the ones you should actually exclude. This is a very important brainstorming exercise that your future employer will highly appreciate and value. Not sure about these skills? Don’t worry about them, we can help you understand them a little more and in reality they’re far less complicated than you believe. Do you think you need some extra-tips that will help you land that dream job of yours? We are here to help you get that job! Try and be completely honest with employers. Don’t use an email address which has bad language in it. Rude words will get you nowhere. Don’t use different fonts, it can be distracting. We just went through a standout freelance writer resume sample: now, if you are also looking for the best freelance writer resume templates, you should check this masterpiece we have been worked on : many professionals like you have successfully used it to take their career to the next level.